When it came to HOKA ONE ONE’s shoes, we’ve always been curious. We’d pick up a pair at our local running shop, mull over it, and think with the best intentions, “I’ll have to give those a try one day.” But, we never did. You see, most runners are pretty picky—probably more like obsessive—over their shoe choices. Once you find something that works, you stick with it. And God forbid they change… that’s when you might have to go out in search of something new. That pretty much describes our multi-sport editor, Tracy, to a tee. So, when HOKA reached out to us with the news that they’d just signed Mirinda Carfrae to their growing triathlon roster, we figured it was a sign (that, and Tracy’s a big Rinny fan). Also for a bit of background, HOKA won the shoe count at Kona last year for the very first time, so clearly it’s a brand that’s catching on for a reason. As the primary tester in this case, Tracy mentioned that she prefers to run in stability shoes due to a history of stress fractures, tendonitis, and other over-use injuries over the years. With that in mind, HOKA recommended the Gaviota and the Arahi 2. For this review, we’re going to take a deep dive into the Gaviota and our experience with it over the last couple months. A similar review of the Arahi 2 will be coming soon! 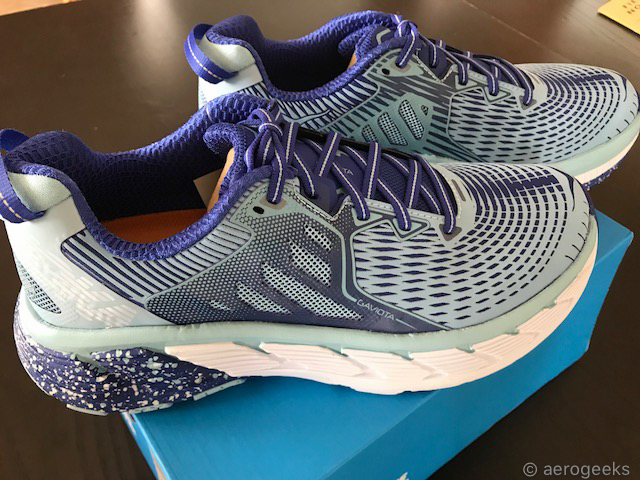 The Gaviota is HOKA’s premium stability shoe, featuring plenty of support via their new J-Frame technology, especially those suffering from pronation issues. The J-Frame delivers both support and protection while guiding your foot without the use of rigid materials, and without hindering your gait. 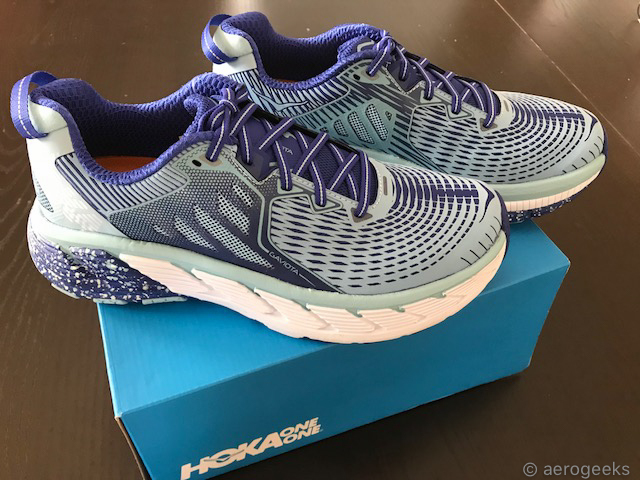 In other words, HOKA claimed that the Gaviota would feel less constricting and lighter than the stability shoes we’ve been used to. While we are focusing on the Gaviota here, one key difference between it and its sister shoe, the Arahi 2, the J-Frame in the Gaviota is made with RMAT – a blend of EVA foam and rubber. This gives it a slightly cushier ride than the Arahi. Now before we go any further, let’s address the elephant in the room when it comes to HOKAs. They look, well… clunky. If you’ve ever picked up a pair, you were probably shocked—in a very good way—when you felt the weight in your hands. They’re way lighter than they look, significantly so. Now that we’ve gotten that out of the way, just remember you can’t judge a book by its cover. The Gaviota design also features HOKA’s Arch-Lock Wings for added support of your mid-foot, as well as a Late Stage Meta-Rocker. To be honest, all of this sounded good in theory, but when we put on the Gaviota for the very first time, it felt like nothing we’d experienced in a shoe before. Tracy wore the Gaviota around for a couple days just to get used to the feel, and then there was that first run… love at first stride sounds cheesy, but that’s exactly what it was. The cushioning was incredible, as was the support. The Meta-Rocker technology made for an amazingly smooth run, even if you’re naturally more of a mid-foot striker like us. Tracy is an over-pronater, and it only gets worse as she gets tired and her form starts to suffer. This has led to all kinds of issues, including posterior tibial tendonitis that can get painful when it flares up. Coincidentally, Tracy was experiencing some achiness when she slipped on the Gaviotas for the first time; however, the run was incredibly pain-free. At first, she thought it could be some kind of odd placebo effect. But sure enough, it’s been a couple months now, and Tracy’s tendonitis hasn’t flared up once. In fact, her feet have felt great during each run in the HOKAs. She’s felt completely supported with each stride, but not restricted in any way. She’s actually described the feeling of running in the HOKAs much like gliding—it feels very natural. We’ve seen other reviews of HOKA report a mix of opinions with the toe box. Some found it constricting or too narrow, but we thought it was perfect. In fact, Tracy typically would buy wider shoes just to ensure there was enough room for toe spread (she has a mild neuroma in her left foot). This wasn’t a problem with the Gaviota. Needless to say, we’ve loved every run in our Gaviotas and are looking forward to giving the Arahi 2 a try next. If you’re sitting on the fence when it comes to HOKAs, we’d highly recommend giving them a try—especially if you’re in need of a shoe that offers solid support without extra weight and restriction. While a little on the pricier side at $150, we think the Gaviotas are well worth the investment. After all, you only get one set of feet. And we’re pretty sure Tracy isn’t going to be putting hers in anything else for a little while.